– please contact us on 07825 994946 / 01785 660759 or email paul@drivesystemsuk.com with your requirements. 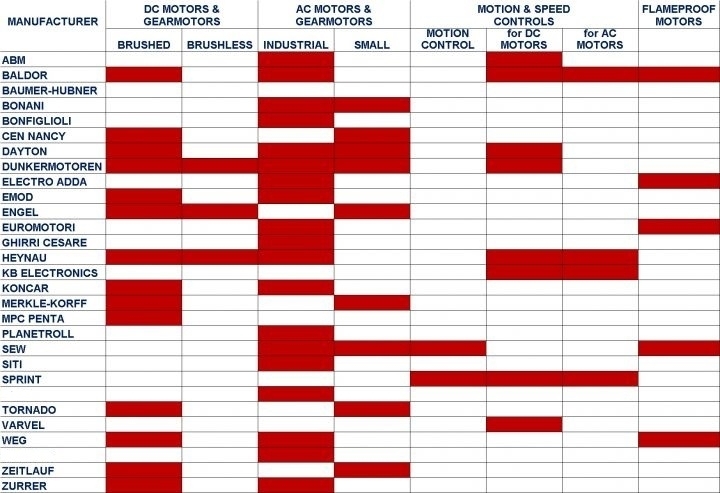 If your motor manufacturer is not listed or you have an obsolete or hard-to-find model then give us a call as we can probably find an exact match. Applications include all types of large and small machinery including for example invalid mobility aids, mobile plant and equipment, and machinery for packaging, labelling, ticket dispensing, converting, food processing, medical, vending, point of sale, recreational and manufacturing automation. We also supply drive solutions for large users such as power generating utilities, sewage and water pumping plants, offshore oil and gas installations, mining and quarrying, large materials movement and storage, cranes and hoists, refineries and chemical plants as well as customised motor, gearmotor and control solutions for a wide range of Original Equipment Manufacturers requiring fractional horse-power up to large integral horse-power units.